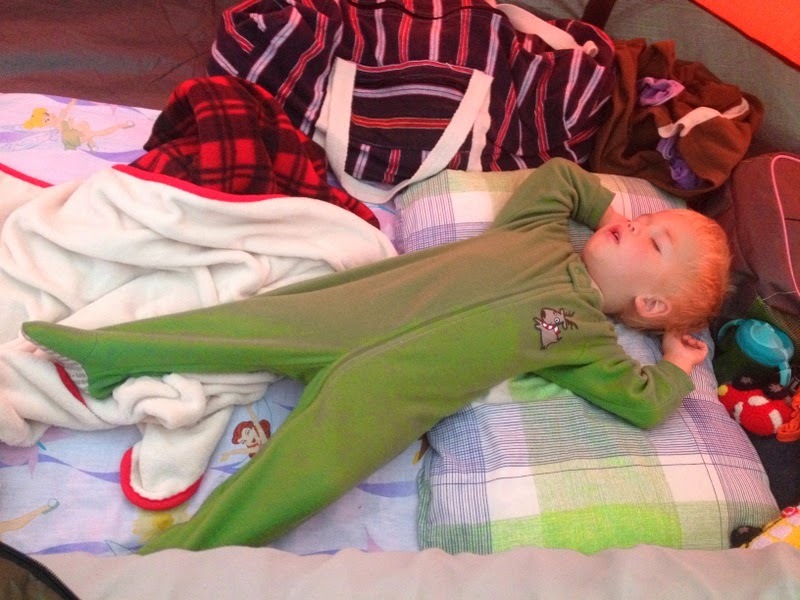 Heissatopia: All is well! All is well! Before zipping ourselves into our sleeping bags last Monday night, we checked the weather forecast, which said Tuesday was going to be a rainy, rainy day. We'd already been rained on several times and our tent did a wonderful job of keeping us dry but we didn't really want to pack up in the rain so we planned ahead and set our alarm for 7:00 AM. The forecast called for rain at 9:00 AM. At 6:00 AM I heard the first few drops of rain hit our tent and soon it was raining furiously, with no hint of ever letting up. I couldn't sleep so I got up and started packing what I could, but only after taking pictures of my sweet sleeping children. 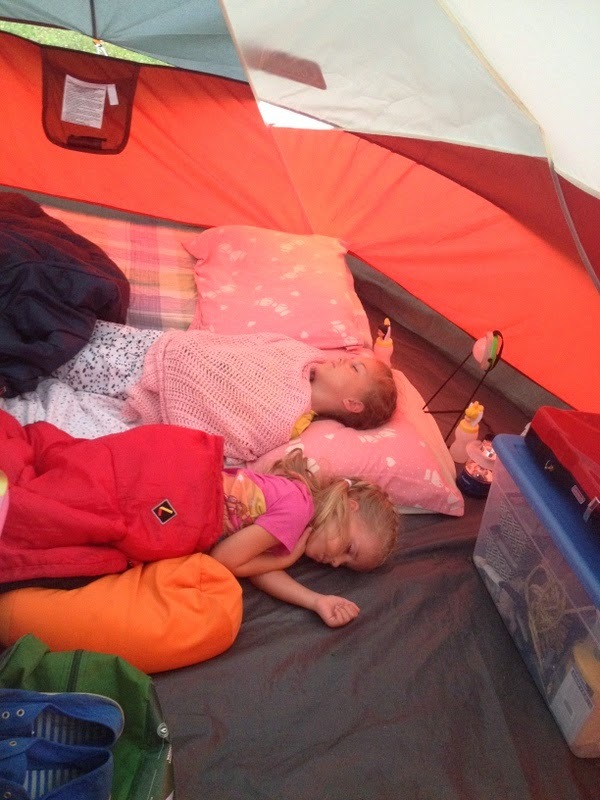 Poor Miriam had been booted out of her bed by Rachel and was sleeping on the floor of the tent. It reminded me of the song There Were Ten in the Bed only in this instance it was the big one who said "Roll over!" and the little one who fell out! The kids sat in the van eating breakfast between counting flashes of lightning. It was a terrible storm, but we had no choice but to pack up right then (other than the equally dismal choice of not packing up and hanging out in either the tent or the van). We were drenched by the time we were finished, and so was everything we'd brought. We originally had planned to go through the Sacred Grove one last time, but decided not to—because rain. Instead we drove to the the Four Corner Churches, symbolic of the religious fervor of the region in the past...and now. Andrew dropped me off on the corner of Main St. and Church St. to take pictures (in the rain) while he took the kids to gas up the van. The Zion Episcopal Church was built in 1872. From what I can tell the Western Presbyterian Church was built in 1834 (but their history is so entwined with the East Presbyterian Church that it's hard for me to be sure—oh, yes, 1834). On April 5, 1849, Winston Churchill's grandparents were married in the Western Presbyterian Church, so that's pretty neat. The First Methodist Church was built between 1866 and 1867, while the First Baptist Church was built in 1871 (according to wikipedia, source of all knowledge). 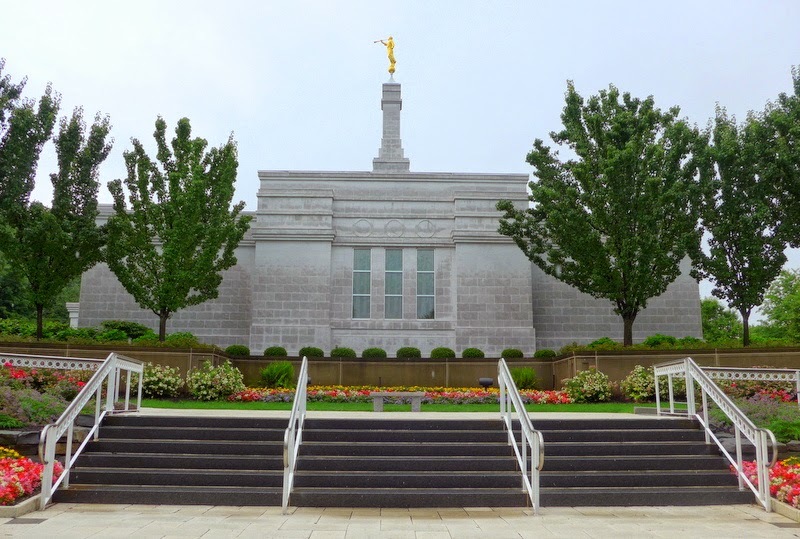 The Church of Jesus Christ of Latter-day Saints was organized on April 6, 1830, so it predates any of the churches standing on these four corners. However, all these religions (and more) were around and active in the community during Joseph Smith's boyhood. They just met in the open air or in dingy log cabins and such. Much like the humble beginnings of the Church of Jesus Christ of Latter-day Saints. I couldn't help reflecting on my pioneer ancestry as I sat there at a temple of the Lord—in a place my ancestors had been driven from. It seemed significant, somehow, to sitting in my "covered wagon," miserable and sopping wet. This is what it feels like to be a pioneer, I thought to myself. And then I laughed at myself because although I was cold, I had the heater blasting (much to Andrew's displeasure). My children might've been whining in the backseat, but I knew that when they got too annoying I could just turn a DVD for them to watch. We stopped at the Family History Library so the kids could use the facilities—complete with indoor plumbing. Our "covered wagon" would soon be traveling upwards of 70 MPH and we'd be comfortably at our destination (a friend's house in DC) in a few short hours. But somewhere, deep down inside, I know that in spite of all the modern conveniences, what I was feeling was a little bit what the pioneers felt. Sometimes, in spite of the best of planning, the pioneers probably (definitely) woke up in their tents, soaking wet. And I'm sure that little pioneer children did their fair share of quarreling and complaining to balance out all the singing they did as they walked, and walked, and walked, and walked, AND walked. They walked away from New York. They walked away from Ohio, from Missouri, and from Illinois. They walked across Iowa, Nebraska, and Wyoming, finally settling in Utah where they were finally left—mostly, but not entirely—in peace. They walked away from their houses and farms. They walked away from the graves of their babies, their husbands, their parents. They were chased out of town by mobs, had their houses raided and burned, and suffered terribly along the trail. They were hungry, weary, cold, and destitute. And yet they kept going. They gave everything up for the gospel. It's not always easy being a Mormon (just as it's likely not easy being anything). I remember the first time I felt the sting of prejudice. I was nine years old and a friend of mine came to school one day and told me that we couldn't be friends anymore because her mom found out I was Mormon. Naturally that wasn't the only time I was treated unkindly due to my religion. There were several occasions when I experienced similar pain—a few years of my life I was regularly accused of all sorts of vile things (devil worship and such) on a fairly regular basis by my peers. I will blame that on the small-mindedness that sometimes accompanies small-town life. Heaven forbid anyone should be different. I've spent the past ten years moving back and forth across the Atlantic. From Utah to Russia, to Utah, to Jordan, to Utah, to Egypt, to Utah, to here—flip-flopping between being part of the majority to being part of a minority. As you can imagine, this has afforded me several unique experiences that have tested and, for the most part, strengthened my faith. Nothing quite compares, though, to what we experienced on Saturday night at the pageant. When we arrived—nearly two hours before showtime—protestors were already out in full force. They were screaming at the pageant-goers over loudspeakers and being very disrespectful. I suppose they had to use loudspeakers, though, since they can't exactly protest on private property and had to stand on the side of the freeway behind the fence. They certainly were angry, though, and continued to holler at everyone until they were quite blue in the face and the pageant had started. I don't know why they stopped protesting for the actual pageant. Common courtesy? Special agreement? The dichotomy presented to us when we reached the amphitheatre, though, was amazing. The cast members were circulating through the audience, greeting everyone with a smile. "Welcome!" they said, "I hope you enjoy your time. Do you have any questions?" I almost hugged the first person who spoke to me kindly after enduring only five minutes of, "You're going to rot in flames for your beliefs! The devil has your soul! Repent or perish, blasphemers!" and so on while we walked from the parking lot to the theatre. The pageant, as I said, was wonderful. The children were enraptured (except Benjamin, who fell asleep), all caught up in the magic and spirit of the show. But as soon as the lights went down, and the audience began to clap, those voices started picking at us from behind the fence once again. I wrapped my sleeping baby up in a blanket, Andrew loaded the rest of our stuff into the stroller, the girls held hands so they wouldn't get separated, and we struck off across the grassy plain (the "parking lot" was a field, you see) while the angry mob shouted at us, hurling insults and lies over the fence, using words that I didn't care for my innocent children to hear. As we marched to our van, sleeping Benjamin grew heavy in my arms, my sweet girls began to cry, the words of the protestors ringing in their ears and mine, despite the Mormon Tabernacle Choir recording trying to drown them out. "Why won't they just leave us alone?" Rachel cried—like, she literally cried those words. "We're not doing anything wrong!" "I know, sweetie," I assured her. "You're not doing anything wrong at all. Chin up, ignore them, and just keep walking." When we got to the van Rachel was nearly inconsolable. "This is what persecution feels like," I said. "This is how the pioneers felt—only worse." It took a lot of talking to make Rachel feel alright again. We talked about the veracity of the protestor's claims. Much of what they said was true. But there were lies mingled in there as well. Was Joseph Smith a perfect being? No. And I can't think of a single prophet of God (let alone person) who ever was. President Monson almost burned a field down after breaking some rules regarding matches (and was a naughty—or at least mischievous—little boy, in general). Moses and Nephi? They both murdered people. King David? Pretty sure he had his faults. The fact of the matter is that God always works through imperfect people because that's what he's got. Though, I suppose, believing that God works through people is one of those things the protestors don't like about me (I know this because they told me so). Apparently God doesn't need men, to which I say, "Then why in the world are you yelling at me through a megaphone, telling me that I'm straying from God's path? Shouldn't HE be doing that? Because if He doesn't need men to accomplish his work...what...are...you..doing? Who are you working for?" We talked about knowing people by their works. The people in the pageant—they were polite, and friendly, and kind. The people behind the fence—they were rude, and full of vitriol and venom. "By their fruit ye shall know them," is what Jesus taught. Also, "Love one another." I really pity the unhappiness of the protestors, I really do, because they hardly even touched my happiness, but I have a hard time believing they're very happy themselves. By and by Rachel cheered up enough to say, "You know, they didn't even really have to stop protesting during the show. We could have just given them a part." "Oh, you know. They could have done all the parts with Laman and Lemuel and everyone else who made fun of the people trying to choose the right!" she giggled. That made me giggle, too. They would have been great in that role! We had a lot of friends say kind things on Facebook about this little persecution we experienced, which was so kind. I was almost surprised to see a few of our friends so shocked that we would be persecuted against because I have seen them pick up their virtual pitchforks, railing against other denominations. It really does hurt my heart just as much when lies are cruelly spread about Islam, or Judaism, or Hinduism, or Buddhism, or Catholicism, or any other religion because I believe that most people are doing their best to be the best people they can be. Getting comments of support ("Ignore those protestors; you're better than them; they don't know what they're talking about; they're just full of hate") was so interesting coming from people who I have known to pick up their virtual pitchforks and rail against (specifically) Islam (specifically Islam because of Andrew's profession—he talks about the Middle East a lot, so...). It isn't right for anyone to be persecuted because of their religion. We may have the freedom of speech but we also have the freedom of religion. They can get so tangled up. So I've made the choice—and urge you to as well—to use kind words. Speak freely, but speak kindly. There's enough hate in the world to go around, and then some. I think we could all use a little more love. Come, come, ye Saints.No toil nor labour fear;But with joy wend your way....'Tis better far for us to striveOur useless cares from us to drive;Do this and joy your hearts will swellAll is well! All is well! I grew up going to he Easter Pageant in Mesa, and I have never heard such language or a megaphone. The protestors stand on the sidewalk with signs- saying some of those things and pass out flyers. I am really sorry you and your kids had to listen and endure that. Oh dear. I shall have to stop railing against Walmart! The poor, underpaid souls are jut doing their (very limited) best. "Jesus said love everyone." I need to remember that. I am so sorry you had to hear such hatefulness. Makes me sad thinking of your girls upset by them. BTW, are you going to tell us what the pageant is about? The Mormon story? It's founding? Maybe you linked it somewhere and I just missed it. I've enjoyed traveling with you via your posts! It showcases a few stories from the Book of Mormon and the restoration of the church. 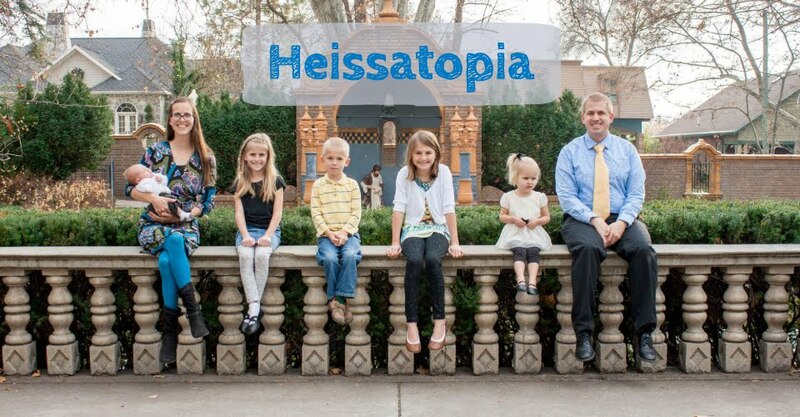 I wrote a bit about it <a href="http://www.heissatopia.com/2014/07/i-spy.html>here</a>.